Sublime the slow pinewoods ever climb and climb. 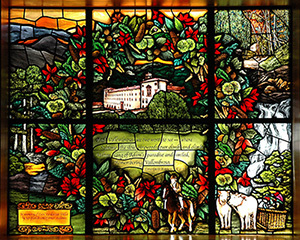 The wreath in the Vallombrosa Window reflects the brilliant foliage of this mountainous region, emphasizing the abundant chestnut forests with chestnut leaves and flowers (long, creamy-colored catkins), the light green "spikey balls" that burst open to reveal the fruit inside, and the resulting brown chestnuts. Also in the wreath are fir tree branches and fir cones, the leaves of the beech tree, and red Virginia creeper, a vine that grows on the monastery walls. The central image shows the Vallombrosa monastery from much the same angle as a rough sketch drawn by EBB shortly after the Brownings' visit in July 1847. In the hills overlooking the monastery is seen Il Paradisimo (the small paradise), built originally as a hermitage or place of secluded retreat. The time of year represented is June or July, and a mixture of olive and forest greens establishes the overall color scheme of the window. The sun rises in the upper left over a dramatic prospect--"a great sea of Appenines...all wild and purple," as Elizabeth described the mountainous view from Vallombrosa. The Brownings' journeys both up and down the mountain began in early morning and her letters describing the experience are full of descriptive exclamation: "Never shall I forget the glory of that morning's spectacle...."
In the lower left corner are boulders and beech trees with their tallk, straight gray trunks, standing near a little "streamlet" that forms a pool reflecting the glow of the sunrise. The forest scene in the upper right corner, with the beginning of a waterfall cascading downward, recalls the scenery the Brownings' encountered on their way to Vallombrosa. EBB was thrilled by the experience: "Such scenery...--such rocks & torrents, such chasms & ravines!... It was a sight to see before one died & went away to another world." In the vignette in the lower right is an image of Elizabeth and her maid Wilson, with a colorful parasol and hat defining the figures, being drawn up the mountain in a basket sledge pulled by two white oxen. Browning rides alongside on horseback in the central portion of the window.